One of the most important parts of going on vacation is making sure that the whole family is there, and if you're like us, your pet is definitely part of your family. 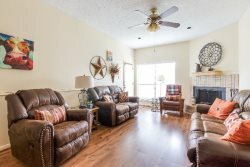 Let us help you find the perfect New Braunfels pet friendly vacation rental for your next trip to Texas. All properties are conveniently located to area attractions, and all units are fully furnished with kitchen necessities and linens.